So you have finally made the big decision and jumped ship from Android to iOS? First of all we would like to congratulate you on making the wise decision. Now after getting your shinny new iPhone the first thing you would want to do is transfer all of your contacts from your Android smartphone to iPhone. The process of doing it is fairly simple and will take a few minutes to complete. We will share with you a number of ways that will enable you to transfer contacts from Android to iPhone. You can choose the one that suits you the best. One of the simplest and quickest ways to import Android contacts to an iPhone or any other iOS device is through the Google account. All you have to do is sign in to your Android device using your Google account and enable sync by going in to Settings > Accounts and Sync (chances are you have already done this so in that case move on). Now after your contacts have been synced to your Google account and appear in Google contacts connect that very same Google account to your iPhone by going to Settings > Mail, Contacts, Calendars option and selecting ‘Add Account’ option. After you enter your email ID and password make sure you enable the ‘Contacts’ option so your Google Contacts are synced to your iOS device. That’s it. While using the Google account to transfer contacts between Android and iOS device is our preferred method of doing this task there are several other methods as well that you can use in order to do so. Transferring contacts with third party application is made easier by following applications. Have all of your contacts stored in a SIM card? Then you don’t require any method mentioned above. 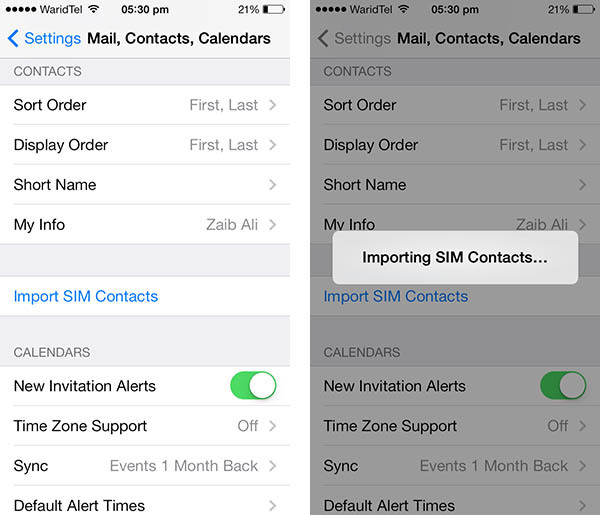 Just put the SIM in your iPhone and import your contacts by going to Settings > Mail, Contacts, Calendars > Import Sim Contacts. That’s it! For our complete guide on it visit this link.